Over the past couple of years the government has been actively encouraging the growth of self-build housing. The UK lags behind it’s European counterparts as far as self-building is concerned, with only around 10% of new homes being self-built or custom built in the UK, compared to around 50% in some European Countries. However, the number of self-builds being carried out in this country is rising and this trend is set to continue with the government’s support. Self-build can be interpreted in a number of ways. Essentially it involves you, the intended occupier, taking full or partial control of the build of your new home. It can literally mean that you design and build most or all of the house yourself, or you might appoint a contractor to build your house, or you might opt for an off-the-shelf approach such as a ‘kit-house’. I would describe myself as an aspiring self-builder in the more literal sense. I am currently building a two-storey side extension and single storey rear extension to my existing house. 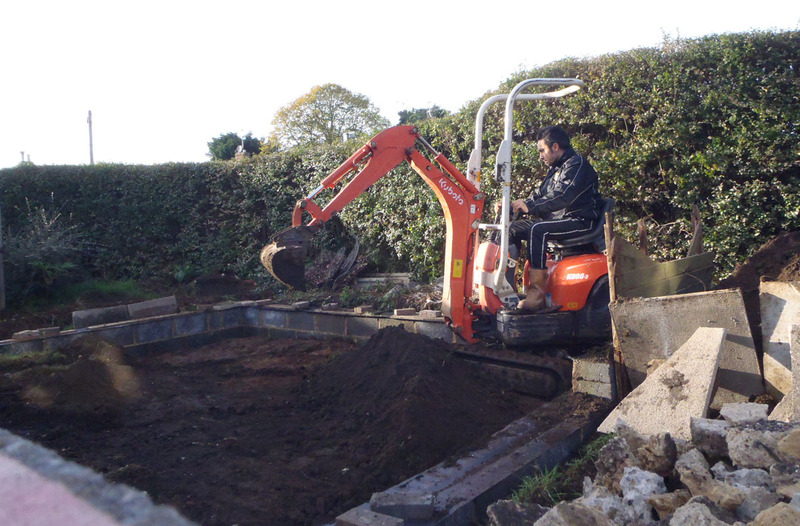 I’m taking on as much as I can myself; excavation, foundations, bricklaying, carpentry, plastering, etc. There are of course some jobs that I cannot and should not take on myself, e.g, electrical or gas work, but these days there are numerous websites that give budding self-builders or DIY enthusiasts easy-to-follow guidance about specific trades or skills. In the near future I plan to take on the bigger challenge of building my own house. If you’re also considering this then there are some great websites which I’d recommend looking up as they specifically cater for serious self-builders. These include the Self Build Portal,the Homebuilding website and the National Self Build Association. These sites can also give you useful guidance about some of the initial obstacles that you have to cross before you can even consider designing your own self-built home. Finding a plot of land is notoriously difficult. Swathes of land in the UK are either protected (e.g, greenbelt), over-developed, unsafe to build on or already owned by opportunist developers. However, it’s not impossible as you will find that there are a number of resources out there to help you find a plot. The government is also continually reviewing potential measures to free up land specifically to help independent self-builders. There is also the major obstacle of planning if your plot of land doesn’t already have planning permission. Planning laws can vary across the UK, and it is extremely difficult to convince a council to allow a new house to be built on an undeveloped plot of land. Sometimes there is a greater chance of success if there is an existing development on the land, e.g, a disused barn that you plan to convert, or a dilapidated bungalow that you intend to replace, but every situation needs to be considered independently. Therefore if you are considering buying a plot of land without planning permission then I would strongly recommend seeking professional advice first. Once you’ve overcome the initial obstacles there are different approaches which you can take to building which have their own pro’s and con’s. I personally prefer to take my time when I’m building something for myself. This requires patience and careful long-term planning to ensure that you don’t compromise your quality of life for what could prove to be a lengthy build period. However, if you persevere with this route you can save money, learn new skills, make changes as you go along, and eventually feel an immense sense of achievement having built your own home. An intermediate approach could be to take on some of the work yourself, but generally appoint sub-contractors to handle different components of the build. For example you can appoint foundation contractors, brick-layers, and roof contractors independently. If you use ‘kit-home’ suppliers you might need just two sub-contractors, for the foundations and the house itself. If you’re comfortable taking on the role of project manager then appointing sub-contractors directly can be as quick as using a main contractor, but you will need to be reasonably capable and confident with managing and scheduling the different trades on site. Of course there are other approaches you can take which require less personal labour but might cost more as a result. You could appoint a contractor to build the entire house. The contractor will often agree to a fixed programme and fixed price. The contractor might also offer guarantees or warranties. The obvious advantages of this approach are that you are given reassurances about costs and the end product, and the build will be completed very quickly. However, you should be aware that the strength of guarantees and reassurances can depend on the integrity of the contractor, so I’d suggest looking for contractors with recommendations and/or accreditations. Sometimes the contractor can also design the house for you. This is normally referred to as ‘design-build’. Some people prefer this approach as it means you can get an all-in-on price for the whole package. However, we would always recommend the more traditional route of having your house designed by an architect or building designer. An architect or designer can help from the earliest design stages, and can go on to produce a construction package of information which several contractors are then invited to ‘tender’ for (bid for). One notable advantage of taking this route is that it often results in very competitively priced building estimates. No matter what approach you want to take we can help you. We can give advice about your planning prospects, or produce and submit a planning application for you. We can help you agree initial designs, interpreting your requirements to produce drawings, illustrations and models to help you visualise the end result. We can develop your designs to ensure that they comply with or excel current building standards. We can advise on different building methods and technologies, helping you weigh up the pro’s and con’s. We can advise on projected costs and construction programmes. We can produce construction information packages catered specifically to your preferred construction approach. For instance, if you intend to use a main contractor we could produce a comprehensive package of information to help ensure good workmanship and quality materials. Alternatively, if you intend to use sub-contractors or take on much of the build yourself we could provide a reduced or simplified package of construction information, with proposed methods and materials adapted to the resources that you are likely to have at your disposal. We can assist with site management and oversee construction, or if you prefer to project manage yourself we can give you good advice about how to keep control of costs or programme. Interest read. I’ve just finished building my own extension and really enjoyed the experience. Anyone can do it!